A pilgrimage to Scotland should be on every Harry Potter fan's bucket list. It's the place where J.K. Rowling wrote much of the books and where parts of the movies were filmed. Now, regardless of your magical abilities, you can tour the Scottish countryside like a witch or wizard onboard the real-life Hogwarts Express, Food & Wine reports. The Hogwarts Express featured in the Harry Potter films is actually a Jacobite Steam Train. From April to October of each year, West Coast Railways invites the public to ride the locomotive on a tour across Scotland. Instead of boarding at Platform 9 and ¾ like Harry does in the books and movies, passengers get on at Fort William, a town about 100 miles northwest of Glasgow. Once on the train, guests are treated to views of Scottish lochs and mountains. 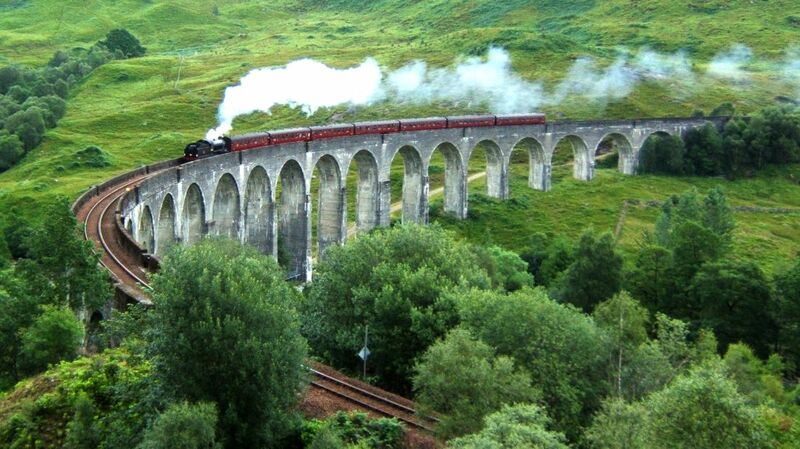 They'll even get to cross the Glenfinnan viaduct—the iconic bridge that leads the train to Hogwarts in the Potterverse. West Coast Railways is now selling return train tickets at about $28 for children and $50 for adults. For the full Hogwarts Express experience, though, you'll have to take the North Yorkshire Moors Railway in England to Goathland Station, which was used as a filming location for Hogsmeade.